5 years. For many, that may seem like a long time but seriously, 5 years or 1825 days to be exact could fly by sooo fast. Take this year for example, would you believe that we're 16 days away from 2016? That's just a little more than 2 weeks and it's time to bid the year good bye. Wow! That said, I couldn't believe that it has been 5 years since my last visit to 22 Prime in Discovery Suites. I'm glad that Paul and I were able to squeeze in a nice steak lunch before checking in at the hotel two months ago for my sister's big day. Despite how long it has been, I could still vividly remember how amazing my lunch at 22 Prime was. 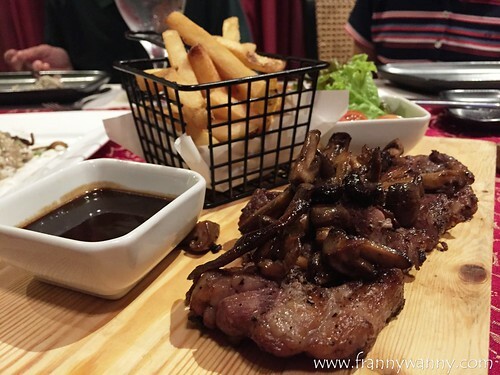 The big Tomahawk steak as well as the delicious bread basket with three yummy spreads brings back delicious memories. I even remembered telling myself that I have to take Paul there given that he loves loves loves steak. Well, finally we managed to do that and it was indeed a nice sunny day to enjoy our steak lunch. 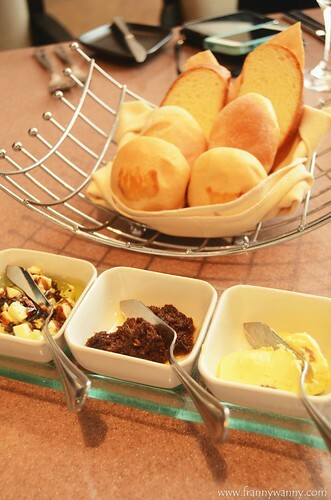 Of course, we started off with their signature Bread Basket with three spreads namely: herb butter, sun-dried tomatoes and feta cheese in olive oil. Paul and I had fun trying all three but really, it was so hard to choose a favorite as I keep on changing my mind every so often. The bread was served warm and it was so soft. As much as we wanted to ask for more, we knew that we have more food to come so pacing is key. We also had the Norwegian Salmon Croquette with Lemon Garlic Aioli for our amuse bouche. 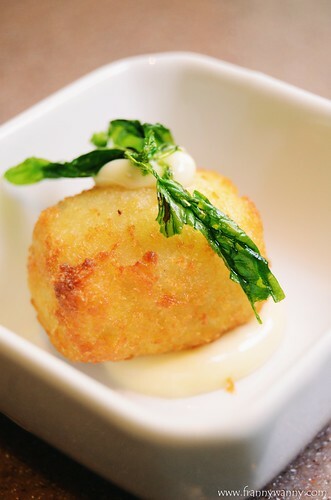 Truth to be told, I love croquette and I love seafood so this one was definitely well-received by my taste buds. My first reaction? "I want more more more!!" 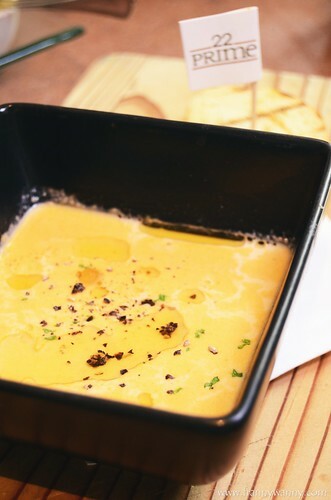 Following this was the Lobster Bisque. It's actually one order split into two. I'm glad we didn't had a full order each as this can get quite filling. The soup was amazing though. The creamy texture which wasn't too heavy, the sweetness from the lobster and the tender meat that you get in every spoonful. I loved it so much that believe it or not, we actually went back to 22 Prime for dinner that same day and I ordered the exact same soup. After enjoying our soup, our server came to our table with a heavy wooden case. 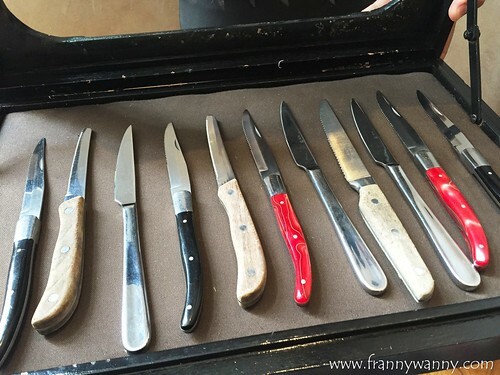 He opened it and in it were a variety of steak knives in different colored handles and in various shape and weight too. Naturally, I went for the girly red one right at the center. Paul told me that if I look closely, they're all different from one another but of course, I just focused on the color of the handles as I made my choice. I shall leave the steak knife technicalities to my geeky nerdy smart hubby. Since we have our knives already, this signaled the arrival of our main course -- 22 Prime's Surf and Turf. This is perfect for people who wants to have a little of everything. Pretty much like me! 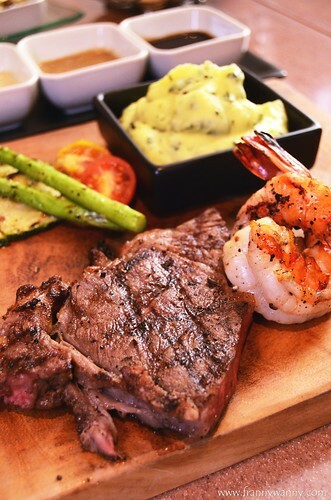 On my heavy wooden board, I got two plump pieces of grilled prawns and a tender cut of steak. In addition to that, I got some grilled veggies and a generous serving of mashed potato too! Oh, it looks like a party plate. 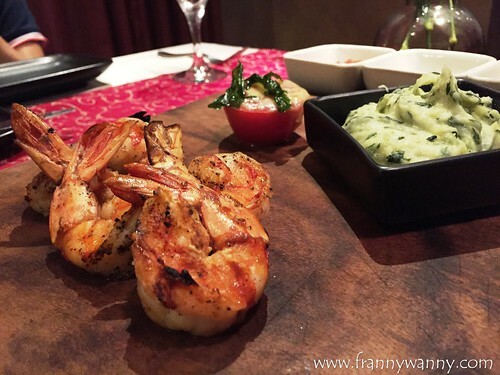 I love the juicy grilled prawns which had a nice smokey flavor and it had managed to stay crisp which is exactly the kind of bite that I love whenever I have shrimps or prawns. The steak was oh-so-tender and while I am not really a big time meat eater, I enjoyed this down to the last bite. Furthermore, the sides were pretty impressive too. In fact, one of my main gripe is when the restaurant presents a really really good main dish but fails miserably with their sides. They really have to understand that both just have to be perfect. Otherwise, a poorly executed sides can ruin the whole dining experience which will then put their effort in making the main dish good..to waste. After having this, I was starting to have serious doubts if I could still fit into my Matron-of-Honor gown the next day. Oh dear oh dear! But..but I couldn't help it! How can I just waste a really good dish, right? I have to let the Chef know that I was so impressed and happy with the food so I made sure to polish the wooden board clean. Of course, what's a good meal without dessert? We had the Chocolate Marquise which was a signature dessert in 22 Prime. 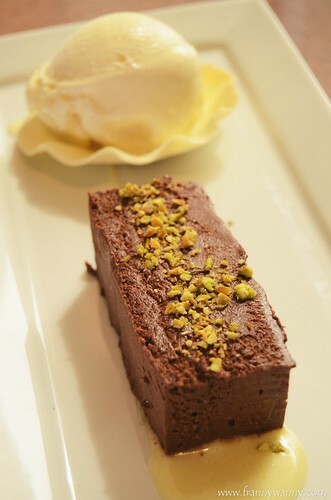 It's very similar to a mousse and if you love chocolate then you have to try this. It was a bit too rich and sweet for me though but I still enjoyed a few scoops here and there. ...well, then I said next return, I was thinking somewhere within the next 3-6 months. What I wasn't expecting was for us to be back after 6 hours! This time for dinner with my family. I guess, I must have been gushing and raving about our lunch that my family then decided to try it for dinner that day. We ordered pretty much the same thing plus a few more extras. 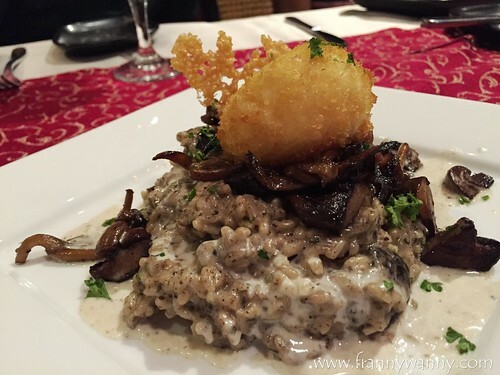 Mommy was craving for risotto for sometime so we tried the Black Truffle Risotto. Unfortunately, this failed to meet her expectations as the rice was a bit under-cooked. We could still bite into some hard grains here and there. The truffle flavor was very strong though so this is perfect if you're a truffle fan like me. For the steak lovers in the family (Papa and Paul), we got the Steak Frites which was once again a winner. Similar to the steak that Paul and I had for lunch, this one was served in bite-sized pieces together with a basket of crispy fries. It was really yummy! Since I enjoyed our Surf and Turf earlier, I suggested that we tried the full order of Grilled Jumbo Prawns. Admittedly, it was a bit too little for the price. However, it came with a generous serving of herb mashed potato which was good as well! I tell you, I rarely go back to the same restaurant twice in one day and it really would take a special and delicious restaurant for me to do that. I think, in my life, this has only happened twice and I really wouldn't mind going back to 22 Prime more often from now on. Check out 22 Prime at the 22nd floor of Discovery Suites Ortigas, 25 ADB Avenue, Ortigas Center, Pasig City. Call them at 683-2222 to make a reservation.